Lake Torrent’s development company has just gone into receivership. Manna Developments, the company behind the proposed Lake Torrent circuit in Northern Ireland, has gone into receivership, according to Companies House. 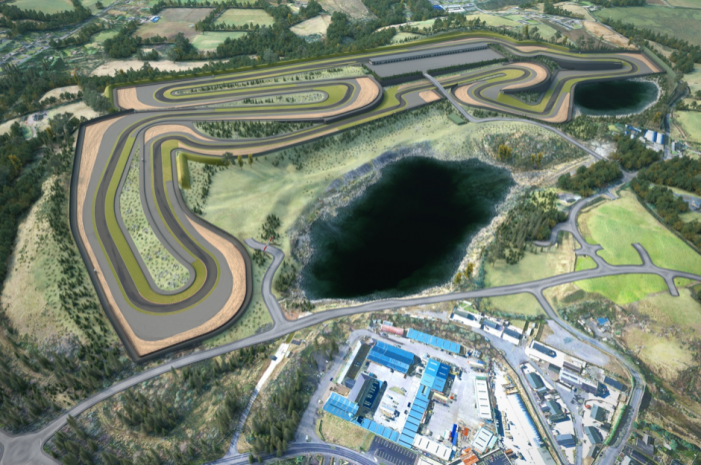 The 160-acre development to turn claypits into a world class motorsport venue - which had already secured a WorldSBK deal - is now under serious threat. The venue, Coalisland an historic mining town with 9 pits in total, is reported to have housed up to £3 million pounds each from investors in bitcoin currency and had operated as an underground virtual mining rig while development proceeded overhead. However, works were ground to a halt earlier this year after a nominated subcontractor brought a canary down a disused coal mine located only yards from the proposed track and it died, prompting a full investigation from health and safety officials which is estimated to run into several million pounds. With the site deemed unsafe even for security personnel, a South Korean crypto group called 'Lazarus' are believed to have shut down the generators and hacked Lake Torrent's mining wallets resulting in accrued losses for the company of up to 30million pounds and leaving them unable to meet any further financial obligations. Attempts to resuscitate the finch failed, and the RSPCA are said to be conducting their own separate line of enquiry into this incident. I am smelling a distinct whiff of fake news, but several Google searches are leading me to believe that this is just about plausible... I'm intrigued! Led by Manna Developments Ltd, construction began on the 2.2-mile complex on the former clay pits site in 2017 but was later halted due to a series of environmental issues. The Coalisland race track was set to create an estimated 700 jobs in the 17-month first phase of construction and transform 163 acres of former clay pits into a "world-class" motorsport complex. Up to 80 part-time staff and temporary positions were estimated to provide ancillary services such as security, engineering, promotions and marketing, with approximately 25 full-time jobs on completion to run and maintain the track on a daily basis with an additional 50 staff required on race days. Earlier in 2017, Mid Ulster District Council granted planning permission for the first phase of work which includes the race circuit, pits, medical centre, restaurant, hospitality suites, six business units and a creche. Permission for a new public ring road to bypass the town and facilitate easy access in and out of the Lake Torrent centre had also been granted. However, the ambitious venture hit the brakes in June 2018 and faced an impasse from the planning authorities over the environmental management procedures surrounding a rare species of dung beetle found in a lunch box during excavations and highlighted within a damnatory wildlife report from the national institute of wild fauna and flora citing alarming concerns over the treatment of the Beetle and it's ability to mate with ongoing distractions from construction activity and ultimately, the envisaged level of auditory dissonance from track racing at the site. Maximus Scarabaeoidea are afforded protection under Law by the European protected species and habitats directive (92/43/EEC) and the circuit has now been declared the insects natural environment at Coalisland. Appointed receivers are inviting offers in excess of £45,000 for the entire plot, which has been designated a Special Area of Conservation and envisaged to become a world class lagoon featuring a spectacular array of indigenous flora and fauna, 'which may encourage an unprecedented level of local interest and international tourism to the area, if handled in a controlled and sensitive manner', according to the Environment department of the Mid Ulster and District Authority. 180 acres for £45,000! Bargain. If Jonathon Palmer were to buy that and Mondello Park...then Ireland would get 2 fantastic race circuits and facilities in the future.